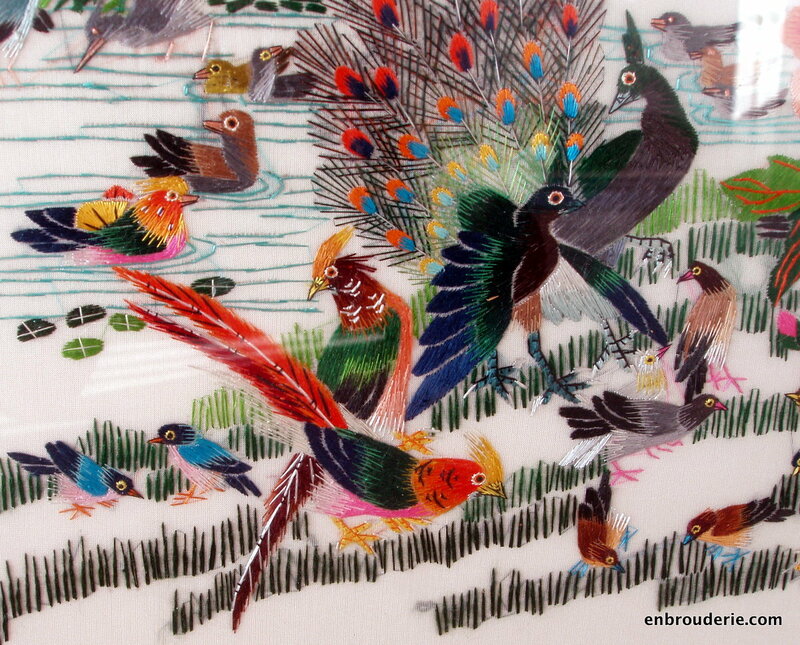 Here is the final installment of photos of the “One Hundred Birds Adore the Phoenix” embroidery (see Part 1, Part 2). 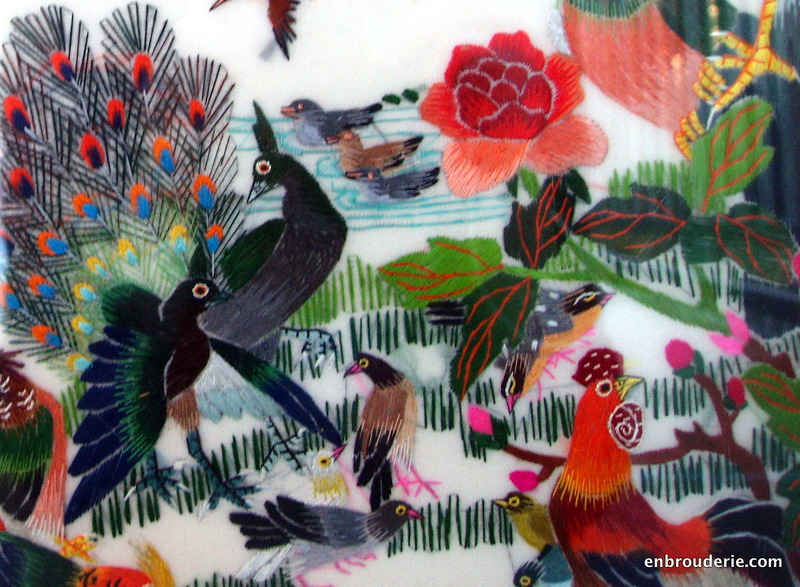 Plus I want to tell you a little more about Chinese embroidery. To follow up on the translation of the writing in the embroidery, given in Part 2, I’d like to mention that including Chinese characters in artwork is very common. In classical Chinese art (in painting and other media as well! ), the words inscribed are as important as the picture. There is a very close interplay between the two. Often the words are from a poem. Now I’d like to discuss Chinese embroidery in particular. The characters for “embroidery” are “刺绣.” The first character, ci, means “thorn.” The left half of the second character, xiu, means silk. So the two characters probably tell you about ancient Chinese embroidery: they used a thorn needle and silk thread. 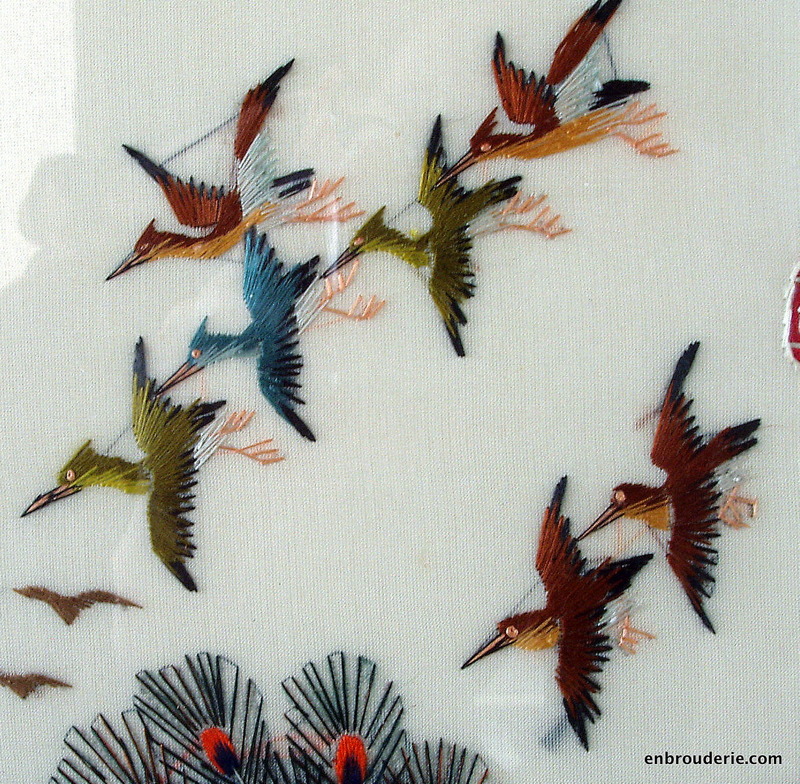 One of my dad’s teachers spoke almost reverently of the great and ancient tradition of Chinese embroidery. She especially recommends two-sided Chinese embroidery. 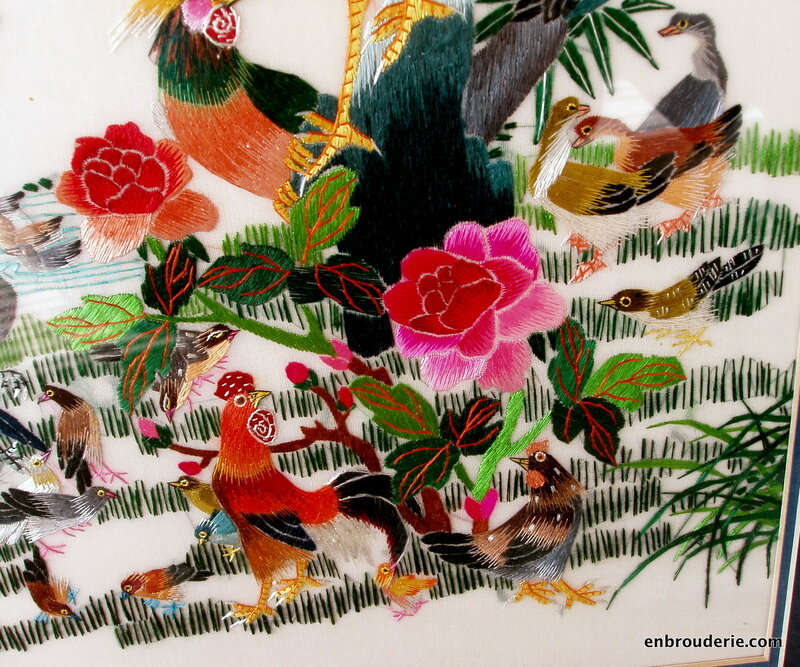 Current Chinese embroiderers greatly fear that this tradition is being lost as machine embroidery becomes ever more common. She says the time to visit the embroidery studios is now while there are some still around. 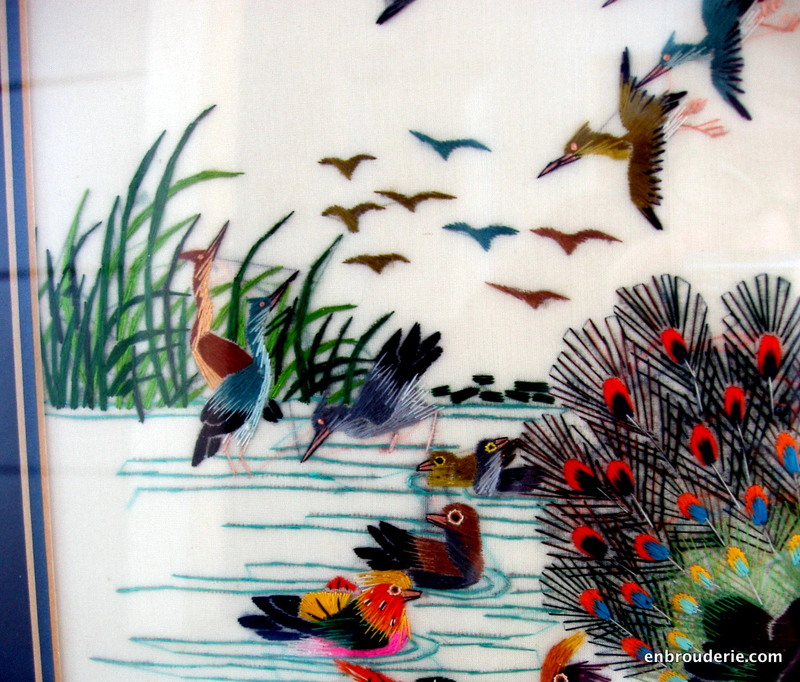 This entry was posted in Embroidery around the world and tagged embroidery, silk embroidery, Singapore. Bookmark the permalink. Not only in China,hand embroiderers in many countries face the same issue because machine embroidery is cheaper compared to hand embroidery & mass production is much easier.For eg. in India phulkari embroidery(popular in punjab) was done by hand earlier but now the same designs are done by machine ,as a result we’ve lost a beautiful form of hand embroidery .It’s really sad that along with embroidery we are also losing handmade laces& handloom weaving too. I am learning Japanese embroidery and I feel very lucky that the Japanese Embroidery Centre in Atlanta has brought this beautiful artform to the West. However, we are well aware that hand embroidery is being lost in Japan also. Along with the weaving, dying, shibori, kimono makers and many other textile techniques and arts and crafts. Basically everything that has taken thousands of years to perfect and pass on generation to generation is disappearing. There is not sufficient demand for beautifully crafted, hand made items anymore. There are not enough young people wanting to become apprentices and dedicate their life to anything. Gradually the specialist tools and materials are also going out of production. When they are no longer available and the knowledge of how to make them is gone, it will be a hard road back. I actually disagree with the pessimistic take – I will work on an essay about why. Thank you for showing us such gorgeous photos – I look forward to reading your essay!